For the last 2 years, we have been buying glasses from a place in Hong Kong whenever we need them. We have recommended them to family and friends as well, and now when we have visitors it is on the list of things to do. Why? Because they are good glasses, and they are cheap. You can buy name brand frames if you’d like (gucci, prada, rayban, and so on), but there are also a lot of other options with their off brand selection. Some of the off brands might need someone to use Google Translate before they name the brand (see image), but there are still a lot of great styles to choose from. There are cool materials to choose from, too – for example there are a few brands that use wood in their frames. You will find frames there that no place in Europe or the USA has. go into the shop, find the frames you want (prices are on the frames). A salesperson will help you and will give you the price of the frames + the lenses you want. If you want the basic lenses, it can be as cheap as 200-300 HKD (220-330 sek, or 25 – 35 usd), and then prices go up if you want certain finishes (anti-glare) or higher quality lenses, etc. transitions lenses (the kind that turn into sunglasses when you are outside) are 880 hkd, or 900 sek, or 110 usd. In theory, you can walk out of there with glasses for 500 HKD (410 sek, 50 usd), if you find a 200 hkd frame and lenses for 300 hkd. 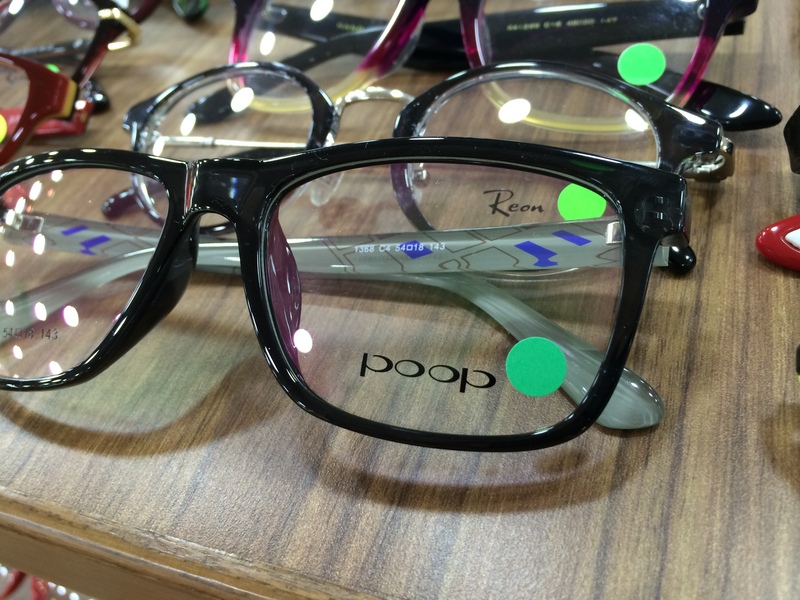 I think more realistic is about 700 hkd (715 sek, 90 usd), because there are a lot of frames for 400-500 hkd. After they have it all sorted with what you will order, they check your eyes. This is the part I like, because it is quick and easy, and when they are done they have really accurate prescriptions. It does not matter if you did not bring your prescription from home (they can fill that one too if you would rather they do that). In my case, my glasses from this place are way better than anything I have bought in Sweden or the USA, at a fraction of the price. They will also put updated lenses into your old glasses (not a lot of places will do that anymore, they prefer to sell you new frames), and they will make any pair of glasses into sunglasses for you. So, if you like the pair of glasses you have with the prescription, they can turn them into sunglasses for you, for 300-400 HKD (310-415 sek, 38-50 usd). The name of the place is i-land Optical, and they have a location in Mong Kok (Grand Plaza, 19th floor, exit E1 at Mong Kok station). There is also a location at Sino Center in Mong Kok, but I have not been there. It can take anywhere from 3 days – 1 week to get the glasses after you order them, so if you have the time, I highly recommend it – check it out! The “poop” brand killed me. Thanks for sharing! Isn’t that hilarious?! Couldn’t believe my eyes. Thanks for reading and thanks for your comment! This is good to know! I’ll be sure to check them out once I’m settled in Hong Kong! Hope you will settle in quickly! Thanks for the comment!